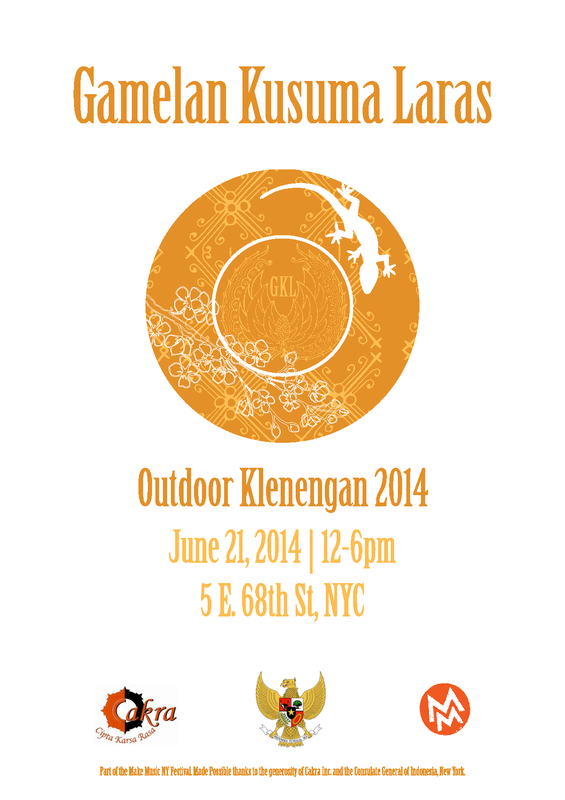 Come to our Outdoor Klenengan Performance onJune 21! We, the Gamelan Kusuma Laras orchestra, have performed the classical music of Indonesia at the Upper East Side Indonesian Consulate for the past thirty years and we would like to host a free concert on 68th between 5th and Madison as part of Make Music New York! A klenengan is an informal gathering of gamelan musicians, often held in Java to ensure the success of an event like a wedding or circumcision. It’s not a performance, but the audience is an important component because the listeners and the musicians together make the event. We received a block party permit to set up the instruments outside of the exquisite Indonesian Consulate at 5 East 68th Street. The event is onJune 21, 2014, the summer solstice. The music will begin around 1 pm, and won’t end until 6 pm. Please join us! And if you can make a donation at http://igg.me/at/gkl it would greatly help us produce this event. We can’t do it without your help! Thank you.